ALBUQUERQUE, N.M. – Do you ever have a question for police, but you don’t want to call 505-242-COPS? Maybe you’re hesitant to talk to an officer directly, or you’re unable to attend a Community Policing Council meeting? Now, you can get your policing questions answered with the click of a mouse. 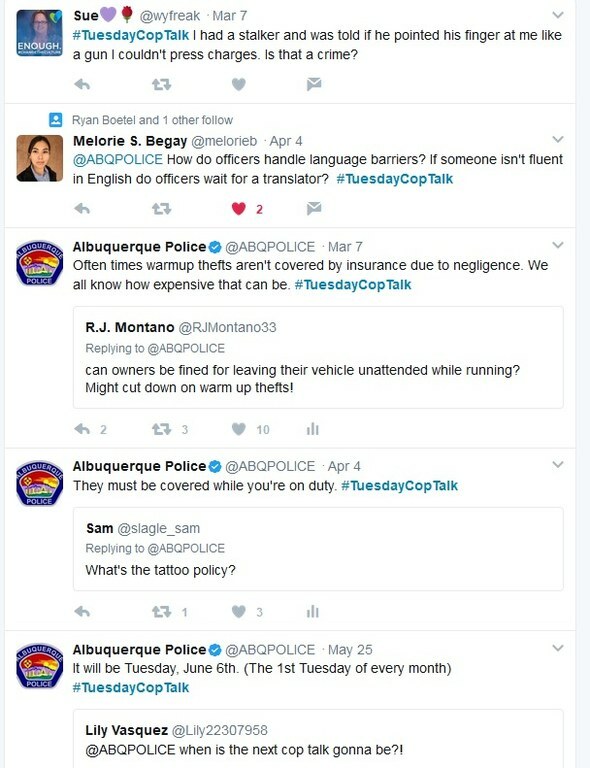 The Albuquerque Police Department will host its monthly #TuesdayCopTalk through social media on Twitter. During the first Tuesday of each month, members of the department will answer questions and listen to the community’s concerns live on Twitter. 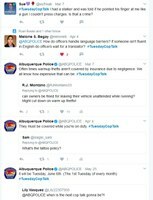 You can Tweet the department your own questions, or follow along with the conversation, by using the hashtag #TuesdayCopTalk. APD’s Twitter handle is @ABQPOLICE. The Department’s Twitter feed is also available for non-Twitter users on APD’s website: www.cabq.gov/police and on the Department’s new mobile application where anyone can view the conversation as it happens. We hope everyone will submit questions, comments and ideas on how to improve policing in your city.